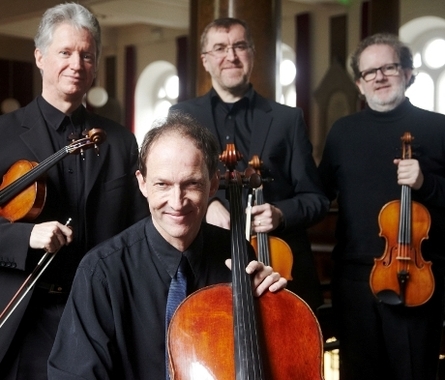 The Vanbrugh Quartet present Harvest, autumn tour 2015, sponsored by Bord na Mona. Ireland's longest established string quartet, the Vanbrugh Quartet was founded in 1985. It is one of Europe's most successful quartets, internationally recognised for its beauty of sound, clarity of texture and integrity of interpretation within an unusually wide and varied range of repertoire. In 1986 it became RTÉ's resident string quartet and won the London International String Quartet Competition in 1988. Familiar visitors to all the main UK festivals, the Vanbrugh Quartet also broadcasts frequently for BBC Radio 3 and performs regularly at London's Wigmore Hall and South Bank. The Quartet enjoys a thriving international career, performing at top venues throughout Europe and the USA, as well as boasting an impressive catalogue of exemplary recordings. We will start with the first of the 10 Celebrated Quartets of Mozart which he dedicated to his friend & mentor Joseph Haydn. This G major quartet is full of joy and pathos and exudes the confidence of the young man's mastery of the medium. The second work is the haunting 8th quartet by Shostakovich which he wrote in 3 days in 1960. In the score it is dedicated to "the victims of fascism and war", but it clearly contains the composer's intense personal feelings. Here is a lovely anecdote relating to an early rehearsal with the Borodin Quartet: "The quartet played this work to the composer at his Moscow home, hoping for his criticisms. But Shostakovich, overwhelmed by this beautiful realisation of his most personal feelings, buried his head in his hands and wept. When they had finished playing, the four musicians quietly packed up their instruments and stole out of the room." We finish with Tchaikovsky's last string quartet: in typical romantic style it explores a vast array of emotions in the desperate and dramatic expressions of grief, the gentle lullaby of the trio section, wonderful soaring melodies reminiscent of his "Swan Lake", and finally adopting a tone of joy and firm resolve leading to a vigorous and optimistic affirmation of life.